A set of young twins were among pupils that died when a three-storey building housing their school collapsed at about 10am at Ita-Faji, on Lagos Island. The twins were pupils of Baden Private Primary School, located at 10, Dagara Street, Ita-Faji. The school occupied the second and third storeys of the collapsed building, with a penthouse also part of it. Shops, offices and a business centre occupied the ground floor. While some neighbours called it Baden, others said it was Ohen Nursery and Primary School. Whatever sign that could confirm the school's name, and even the right address, had been destroyed in the debris. Daily Trust gathered that the school had an estimated population of 170 pupils, most of them in classes when the building came down. There were indications that the owner of the building, one Akinmoladun, was among those rescued from the collapse. His son, Erinoluwa Akinmoladun, told rescuers he had alerted his father earlier that morning about how weak the building was and its possibility of collapsing soon. The National Emergency Management Agency (NEMA) said eight pupils died in the disaster. 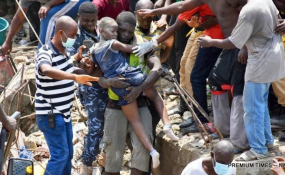 NEMA Public Relations Officer (PRO), in the South West Region, Ibrahim Farinloye, who confirmed the number of death, said that 37 others were rescued from under the debris by rescuers. He added that NEMA's Director of Search and Rescue will be at the scene of the building collapse by 9am Thursday, adding that the Federal Government has sent a team to make Post Disaster Assessment which will entail providing relief assistance to the victims of the building collapse. It was a pathetic sight of wailings and buckets full of tears as parents of the pupils of Baden Private Primary School stormed the accident scene searching for their wards. Even parents whose children were not affected by the tragedy could not hold back tears. More cries rent the air when the bodies of the twin sisters were brought out dead from under the rubble. As the sight drew uncontrollable tears from sympathisers, mostly women, the two corpses were quickly put into an ambulance and taken to the Lagos Island General Hospital mortuary. An elderly lady, who identified herself as Iya Ibeji, said her younger sister's three children, whose name she gave as Amina, Yusuf and Mubarak Oloyede, were still trapped in the rubble. Iya Ibeji disclosed that the mother of the children, Ganiyat, had fainted when she heard the sad news and had been rushed to the hospital. The crowd at the scene rained curses on the owner of the building, even as they accused authorities of the Lagos State and local governments of ignoring calls by concerned neighbours that the building was extensively weak and constituted a danger to its residents. Residents of the area said the building had shown visible cracks at the back. Some put the age of the building at more than 30 years and had been in a state of disrepair. According to a resident in the area, Abdulazeez Elegushi, "A quit notice was given to the owner of the building by the state government after it failed an integrity test. I don't know why they refused to obey government's order. This would not have happened if they had adhered to government's instruction." Babajide Komolafe, a tricyclist who plies his business in the Ita-Faji neighbourhood, said he knew a couple who were residing in the building but moved out when officials of the Lagos State Building Control Agency (LASBCA) first came to earmark the building for demolition and asked residents to vacate the premises. "My two friends who used to live in the building moved out only in November when their rent expired. They said the caretaker was already on their neck to pay for their new rent but they refused because they knew that the house had been marked by officials of Lagos State government for demolition. "I'm surprised that the house and a couple of others which had been marked for demolition were left standing. What we learnt was that some government officials, after the initial marking of the house for demolition, were compromised with bribes in their subsequent visit, otherwise the building ought to have been demolished a long time ago," Komolafe said. The tricyclist maintained the school's name is Ohen Nursery/Primary School and that it has been running in the neighbourhood for more than three years. A fruit seller on the street, Bimbo Animashaun, also said the disaster was avoidable, noting that last year government officials came to the Ita-Faji area to ask residents to vacate houses they noticed were in distress. She said the three-storey building was among those marked by the officials. One of the traders with a shop at the building, Emeka Chukwuka, also said the house had been showing signs of crack before it eventuality collapsed yesterday. Lagos State Governor Akinwunmi Ambode, who visited the scene at about 2.30pm, ordered a full-scale investigation into the tragedy. The governor said his Deputy, Dr (Mrs) Oluranti Adebule, had also visited the hospitals where some of the victims rescued had been taken to and assured that the state government would immediately take over the treatment of the victims and foot their entire bill. Ambode said he had received information that the building was a residential one, with the school operating illegally within the premises, adding that about two floors of the building had sunk to the ground. He said most of the buildings in the area had been marked for demolition, but that some property owners in the area defied such notices. "The building is not technically a school but a residential building that was actually accommodating an illegal school, so to speak on the second floor. "Like we have said, we have been carrying out a lot of integrity test on the buildings in this neighbourhood and some of them have been marked for demolition. But we get resistance from landlords. We must continue to save lives and would intensify our efforts to see that those that have failed our integrity test are brought down," he said.